Global risk assets continue to perform strongly with the S&P/ASX 200 up about 2% along with the US S&P 500 index. Earnings season in the US has been good, with companies posting another quarter of robust profit growth. Short-term bond yields continue to rise as the US Federal Reserve continues to maintain its outlook on interest rates with Jerome Powell announced as the next Federal Reserve Chair. Markets view this appointment to mean a continuity of Yellen’s approach. Meanwhile, long-term inflation and growth expectations remain muted, suppressing long-term bond yields. The Australian Dollar has fallen to about 76 US cents as the spread between Australian bonds and US bonds continues to tighten. Local inflation figures remain weak at 1.8% for the year. This remains below the Reserve Bank of Australia’s (RBA) target, with the RBA downgrading their forecasts for future inflation. This means that the chances of a domestic interest rate hike have fallen despite months of improving employment. Other local data such as the AIG Manufacturing Index and retail sales figures were also weak, culminating in a weakening of the Australian Dollar over the past month. Elsewhere in the developed world, economic activity continues to show strength. The US unemployment rate fell to 4.1% while activity surveys continue to indicate decent growth expectations across manufacturing and services despite the recent weather conditions. Wage growth remains the missing ingredient as October figures showed no growth from September after the strong figure last month. European preliminary inflation and GDP figures were also strong as it continues to recover from a weak base. The European Central Bank announced that it will halve the monthly purchases of its quantitative easing program in January 2018 and will continue at that pace until September 2018. It also announced that the program will be kept open-ended to provide flexibility if economic activity starts to weaken again. Meanwhile, China looks to be continuing to reach its growth objectives while focussing on deleveraging its large debt burden. Worries still persist on the ability to maintain the growth rate while reducing debt but recent figures point to China managing this well thus far. The US tax reform proposal is currently the key event that markets are fixated on. The preliminary tax bill has come under heavy debate and it remains to be seen if Donald Trump’s administration can push through their first major reform by the end of the year. Many of you may have heard of Warren Buffett’s mentor, Benjamin Graham, who is often viewed as the father of value investing. The principle of value investing is simple; buy an asset for a price that is below what it’s worth (intrinsic value), and sell an asset for a price that is above its intrinsic value. Although the principle is simple enough, the application is notoriously difficult. The primary issue lies in determining the intrinsic value. When two people are presented with the same information for the same opportunity, in all likelihood, they will come up with a different value for the same opportunity. Even if the final value figure they arrived at is the same, there would likely be differences in the underlying building blocks leading up to that final value figure, meaning that their future valuations would deviate. The other issue would be that the value of an investment is based on its future return to its potential owner. This involves forecasting long into the future. Some argue this is a fool’s game given that even company management and insiders are not able to consistently estimate a single year ahead as seen in the many upgrades and downgrades of corporate guidance. Hence, Graham preached the ‘margin of safety’, educating investors to buy at a big enough discount to allow for error in the estimation of intrinsic value. 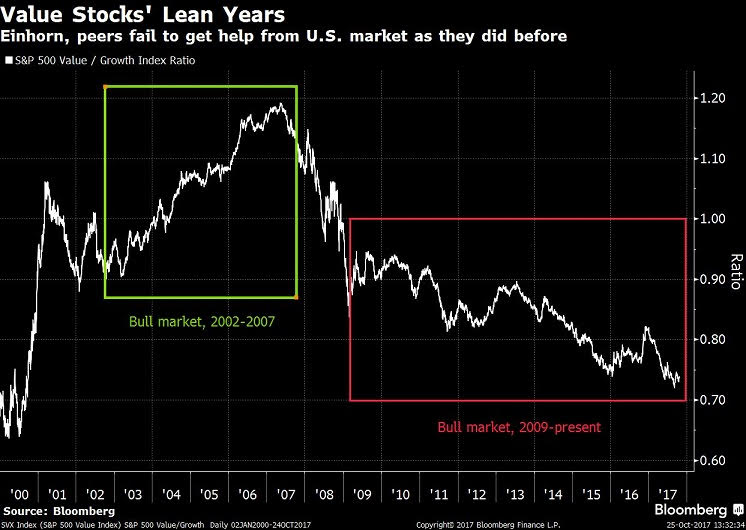 The current bull market has been a nightmare for value investors. Value investing would have cost investors massively in terms of performance relative to the overall index. The chart below shows that in the current bull market, value investors have underperformed growth investors massively, prompting well-known value investor, David Einhorn to muse ‘whether value investing is a viable strategy’. However, this sort of underperformance has happened in the past. In the times of the Nifty-Fifty and the Tech Bubble, growth far outpaced value, only to subsequently reverse. As seen in the chart, leading up to the Global Financial Crisis, it was value investing that dominated performance. Like most of the investment and business world, investment styles also seem to run in cycles of boom and bust. Therefore, the merits of value investing should not be discarded or forgotten, and there should be no surprises when value begins to outperform once again.